Here you can find all info about AutoFrisian Dew from Dutch Passion. If you are searching for information about AutoFrisian Dew from Dutch Passion, check out our Basic Infos, Gallery, Awards, Strain Reviews, Shop-Finder and Price Comparison, Lineage / Genealogy or User Comments for this cannabis variety here at this page and follow the links to get even more information. If you have any personal experiences with growing or consuming this cannabis variety, please use the upload links to add them to the database! 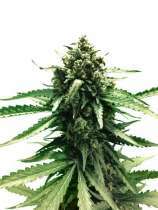 AutoFrisian Dew is an automatic flowering ruderalis/indica/sativa variety from Dutch Passion and can be cultivated outdoors and in the greenhouse where the female, autoflowering plants need ±74 days from the seedling to the harvest. Dutch Passions AutoFrisian Dew is/was only available as feminized seeds. AutoFrisian Dew is the autoflowering version of our outdoor best seller Frisian Dew. AutoFrisian Dew is the very first AutoFem variety developed outdoors in Holland and especially developed for outdoor growing in Northern climates. AutoFrisian Dew has taken two years to develop and the selection process and breeding also take place in Holland. AutoFrisian Dew was created from a strong and robust "green" phenotype of Frisian Dew. This results in good quality strong cannabis, ready to harvest around 10-11 weeks after the seed germinates. The use of the green Frisian Dew parent means that purple offspring account for only 10% of the AutoFrisian Dew, 90% of them are green. AutoFrisian Dew is approximately 1m tall though it can grow up to 1.3m in good conditions. She has a strong main cola and has a sweet taste with earthy flavours. Best yields are achieved in warm, sunny outdoor location or greenhouse. Yields of 50g+ per plant are standard, 100g+ in optimum conditions. AutoFrisian Dew is a strong, hardy and mould-resistant variety which will be appreciated by outdoor growers. It should be planted outdoors from April onwards in southern Europe. In North Europe it does best when planted out after the last frost in May/mid-May. 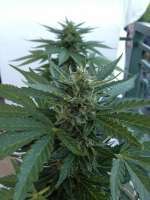 Where to buy AutoFrisian Dew cannabis seeds? AutoFrisian Dew from Dutch Passion is available only as feminized seeds. Regular seeds are not available at the moment. In 18 seedbanks, we found 46 offers between USD 6.79 for 1 feminized seed and USD 1685.73 for 150 feminized seeds. If you are looking to buy AutoFrisian Dew Cannabis Seeds from Dutch Passion somewhere - have a look to our AutoFrisian Dew Price Comparison page with all current offers from all the connected seedbanks and shops - or visit one of the following tested, trustworthy and recommended seed-shops directly to check out their current AutoFrisian Dew offers: Herbies Head Shop, Discreet Seeds, Linda Seeds | Linda Semilla, Hanfoase & Stecklingsexpress, Indras Planet GmbH, Dutch Passion, canna-seed.com, Zamnesia, Chu Majek, Seeds24.at, Canna-Seed Seed Shop, Oaseeds, PEV Seeds Bank, Cheeba Beans, Alchimia Grow Shop, Original Seeds Store, Samenwahl.com and Mary's Seeds. Dutch Passions AutoFrisian Dew is a cupwinning variety and won the 3rd Place at the Highlife Cup 2014 in the category Automatics, submitted by Dutch Passion! We've collected strain info from one grower for AutoFrisian Dew. AutoFrisian Dew gets 5.67 of 10 possible Points in the average! Here you see the latest AutoFrisian Dew photos, uploaded from our users! Altogether we've collected 2 pictures from Dutch Passions AutoFrisian Dew, check out our AutoFrisian Dew gallery to view them all. Click to show all parents of AutoFrisian Dew in our dynamic family tree map. Altogether we've collected 1 user comment about Dutch Passions AutoFrisian Dew. Unluckily not one of this comments is in english! To read them anyway, please click on one of the following links: german (1). Do you know something more about Dutch Passions AutoFrisian Dew? Please help to make this database better and upload/connect your information here! Pictures speak louder than words! Upload your "AutoFrisian Dew" Photos here and help other growers to get a better impression of this variety. You have grown AutoFrisian Dew together with another variety? Please fill out our Strain VS. Strain direct comparisation form! Our strain reviews are multilingual, searchable and can be very detailed - including data about the grow, aroma, effects and taste! Please upload your AutoFrisian Dew Review here to help the other seedfinder users! You have experience with the medical qualities of AutoFrisian Dew? Sharing your information here maybe can help other people! You've stumbled upon a AutoFrisian Dew related thread into a forum or growers community? Connect it here and enable othe users to find this information fast and easy! You found a related video with additional information or grow-infos about AutoFrisian Dew on YouTube? Please connect it here to the strain info page!